You'll be £4.99 closer to your next £10.00 credit when you purchase Stalingrad. What's this? 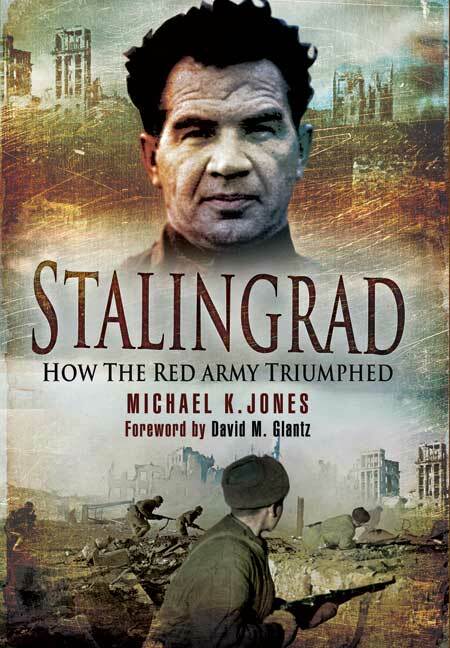 Michael K. Jones's new history of Stalingrad offers a radical reinterpretation of the most famous battle of the WW2. Combining eyewitness testimony of Red Army fighters with fresh archive material, the book gives a dramatic insight into the thinking of the Russian command and the mood of the ordinary soldiers. He focuses on the story of the Russian 62nd Army, which began the campaign in utter demoralisation, yet turned the tables on the powerful German 6th Army. He explains the Red Army's extraordinary performance using battle psychology, emphasising the vital role of leadership, morale and motivation in a triumph that turned the course of the war. Of all the books written about Stalingrad, there have not been many like this one. Nor have there been many like this on the Russian Front as a whole, or any other battle, campaign, or theatre of World War II... Stalingrad provides a wealth of thought-provoking material, including new interpretations of many of the generally accepted accounts of the battle... Jones performs an admirable job of analysing the officers and troops of 62nd Army, Chuikov in particular... Recommended. The battle of Stalingrad was one of the key turning points of the Second World War, and ended as an epic Soviet victory, but during the first part of the battle it was the Germans who looked to be on the verge of winning a crucial victory. Jones focuses on this first phase, when the outnumbered Soviet 62nd Army struggled to hold onto a narrow strip of the city on the banks of the Volga. One of his main aims is to strip away the layers of Soviet propaganda, from both during and after the war, that obscured the real events of the battle, instead presenting an ideologically correct view of the fighting. This has two main effects. Most importantly it becomes clear just how close the Germans came to victory - on at least one occasion the correct use of already available reserves would have been enough, but General Paulus, the German commander, was too methodical and too far from the battle to take advantage of his chances. The second is the dialogue becomes far more convincing - stilted Soviet orthodoxy is replaced by something rather more earthy. The two commanders emerge as key figures. Vasily Chuikov spent almost the entire battle on the western bank of the Volga, coming under direct fire on numerous occasions. On contrast Paulus spent most of his time well back from the city, and appears to have been a rather distant figure. Jone's account of the battle reveals that it was much more closely balanced that the official Soviet accounts would suggest. The official view of an inevitable triumph of the Soviet system becomes a much more impressive achievement, won against apparently overwhelming odds. This is a very valuable piece of work that helps to reveal a more accurate view of the fighting on the Eastern Front. Jones is good at highlighting how impossible it was for post-war Soviet historians to mention any negatives; the artillery's intelligent move to the east bank caused terrible despondency at the time, but was overlooked by Russian history. The Battle of Stalingrad was a major battle of World War II in which Nazi Germany and its allies fought the Soviet Union for control of the city of Stalingrad (now Volgograd) in southwestern Russia. It took place between 17 July 1942 and 2 February 1943. The battle is considered by many historians to be the turning point of World War II in Europe, comparable to the way the Battle of Midway is considered to be the turning point of the Pacific War. The battle involved more participants than any other on the Eastern Front, and was marked by its brutality and disregard for military and civilian casualties by both sides. It was amongst the bloodiest in the history of warfare, with the upper estimates of combined casualties coming to nearly two million.